Allergy Advice: Contains gluten and soyabean products. 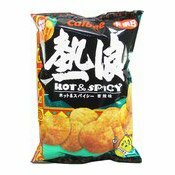 Ingredients: Potato, Vegetable Oil, Spices, Sugar, Flavour Enhancer (E621, E627, E631), Salt, Soy Sauce Powder (Contains Colour E150c), Yeast Extract, Hydrolysed Vegetable Protein, Anticaking Agent (E551, E535, E500), Spice Extractive (Contains Emulsifier E471), Flavour, Maltodextrin, Sweetener (E951). 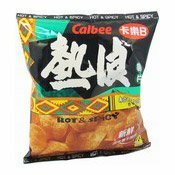 Simply enter your details below and we will send you an e-mail when “Hot & Spicy Potato Chips (卡樂B熱浪薯片)” is back in stock!